I sacrificed a burrito to the “Hockey Gods” today, hopefully they like Mexican and make scoring happen. 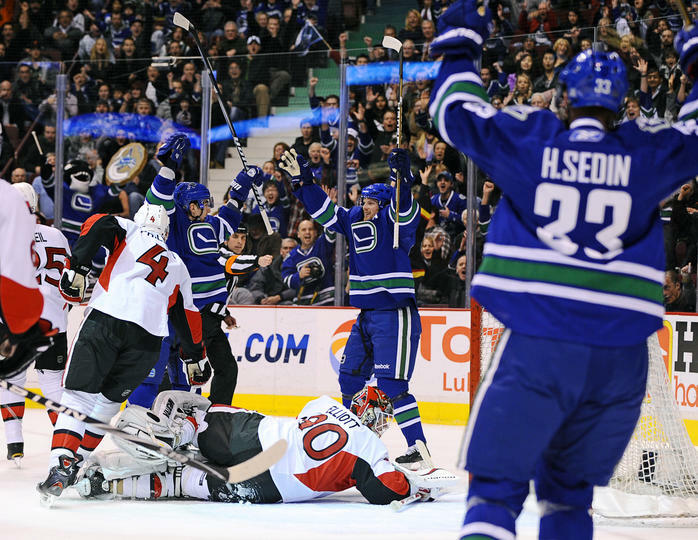 Looking to get back on the good side of the Hockey Gods, the Vancouver Canucks take on the Ottawa Senators tonight at the Canadian Tire Centre (formerly Scotiabank Place). The first of a 4-game road trip, the Canucks are looking to correct their offense, which has been downright offensive during their current slump. The Senators won a hard-fought game against the Washington Capitals last night, rallying back from an early 2-goal deficit to win 6-4. The tired Senators have only won 4 of 12 home games this season so home-ice advantage may not be as much of an advantage, especially considering the visiting Canucks have won 7 of their 13 road games. For all their recent struggles, a quick road trip may be what our Canucks need. The optimist in me thinks this game could be different. Maybe some time away from Fin’s constant manhandling of his drum or the “I-bought-this-ticket-but-now-my-kid-can’t-go-to-college” crowd can help relieve some pressure from the mounting losses. Since a 4-game win-streak a month ago, the Canucks are a woeful 3-5-4, including their current stretch of just 1 win in their last 8 games. In some Freaky Friday sort of thing, set-up man Henrik Sedin has 4 goals in 5 games, while sniper Daniel has 4 assists in 3 games. The Sens’ Craig Anderson, who garnered some Vezina attention last season, has an .899 save percentage (36th in NHL) and a 3.36 GAA (42nd in NHL). He’s let in 4 goals or more in 6 of his last 8 games, including in each of his last 3 games. But before the Canucks start salivating at the possibility of putting some pucks past Anderson, he did start against the Caps last night so chances are Robin Lehner will get the start tonight. Jordan Schroeder remains out with his ankle injury for the Canucks, while Ottawa’s Mark Borowiecki is not expected to play with a strained neck.